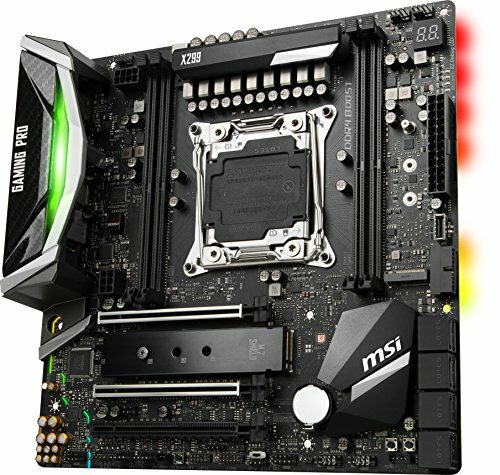 While ASRock’s X299-ITX/ac is the undisputed king of small form factor high-end desktop (HEDT) motherboards, micro-ATX still offers a handy space-saving size with the benefit of more ports and, unlike the ASRock board, the MSI X299M Gaming Pro Carbon AC can house full-sized DIM Ms in its quad-channel memory slots. It’s also over cheaper than the ASRock board and comes with plenty of features too. Unlike the ATX X299 boards we’ve tested since the chipset’s launch in July, the X299M Gaming Pro Carbon AC only has four DIMM slots. That’s usual for micro-ATX HEDT boards, though, and it still offers enough room for 64GB of quad-channel memory. 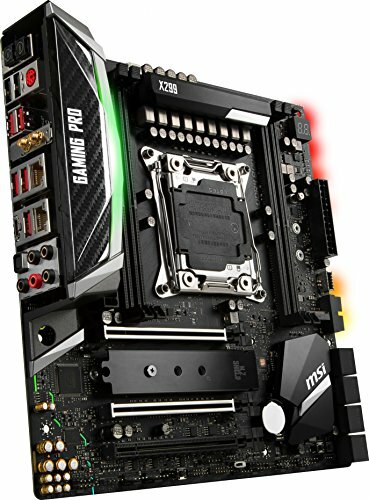 By cutting four memory slots from the board, MSI also manages to fit two M2 ports on the top of the PCB, with one offering a heatsink, and both supporting SATA and PCI-E NVMe SSDs. As you’d expect at this price, you get all the usual overclocking tools, with power and reset buttons located below the PCH heatsink, a dual-BIOS switch found below the bottom PCI-E slot, plus an LED POST code display. You’ll also find clear-CMOS and BIOS flashback buttons on the rear I/O panel, along with seven USB Type-A USB ports. What’s more, you also get USB 2, USB 3 and USB 3.1 Type-C headers on the PCB, so we doubt anyone will be left wanting here. There’s a generous count of eight SATA 6Gbps ports too, so there’s plenty of scope to expand your storage beyond the two M.2 ports if necessary. Meanwhile, the five 4-pin fan headers should be ample for most systems, and MSI’s EFI and Windows-based fan control systems are excellent too, whether you’re controlling all-in-one liquid cooler pumps or case fans. The dedicated pump header can dish out up to 24 W of power too, which should be enough even for fully fledged water-cooling pumps, such as the Laing DDC and D5, which you can then control from the EFI or software. MSI’s EFI gives you great tools to tweak and tune a powerful PC steel cases. Meanwhile, on-board audio is provided by the usual Realtek ALC1220 codec. There are no layout issues either, with the exception being cramped spacing between the two primary 16x PCI-E slots (which each get the full 16 lanes if you have a Core i9-7900X or above). They’re so close together that dual-slot graphics cards will see the top card’s cooler blocked. This situation is par for the course for micro-ATX motherboards, but you’d be well advised to water-cool your graphics cards if you want an SLI or CrossFire setup, to prevent the top card from throttling. 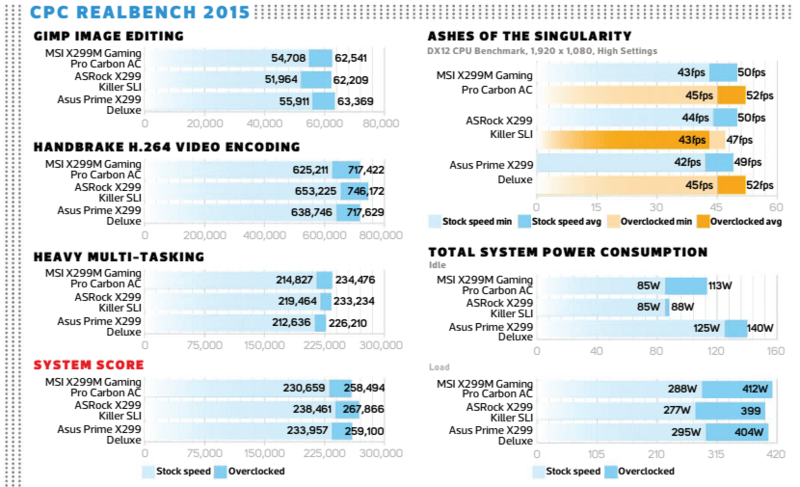 The GPU throttling situation was borne out in our gaming benchmarks. While the X299M Gaming Pro Carbon AC was on par with other boards in Ashes of the Singularity, switching to slightly longer, more graphically demanding benchmarks such as Unigine Valley saw it trail the rest of the field by a sizeable margin. The issue here, as expected, came from the close proximity of the top Radeon RX 480 with the second card in the CrossFire setup we use to test X299 motherboards – the top card was starved of air and throttled as a result. However, this situation is true of all dual-GPU setups on micro-ATX motherboards, so we can’t hold too much against MSI here, especially when its performance is otherwise bang on. the latter – it wasn’t sitting under a hot graphics card and was also able to make use of the airflow from the front of our test rig. Nevertheless, the heatsink did yield lower temperatures than not using it, and there was no sign of throttling impacting the SSD performance. When it came to overclocking, we managed to hit our usual 4.6GHz frequency with Intel’s Core i9-7900X using a vcore of 1.24V, which is average for our CPU sample. Raw performance numbers were all on the money, though, with a system score of 230,659, which rose 12 per cent to 258,494 once overclocked. Audio performance was also excellent with a chart-topping 119dBA dynamic range level in RightMark’s Audio Analyzer software, while the noise level hit just -113dBA. While the M.2 heatsink didn’t perform as well as other boards, and two-way GPU setups will require water-cooling throttling, we have no hesitation about recommending the MSI X299M Gaming Pro Carbon AC for building a compact high-end desktop rig. 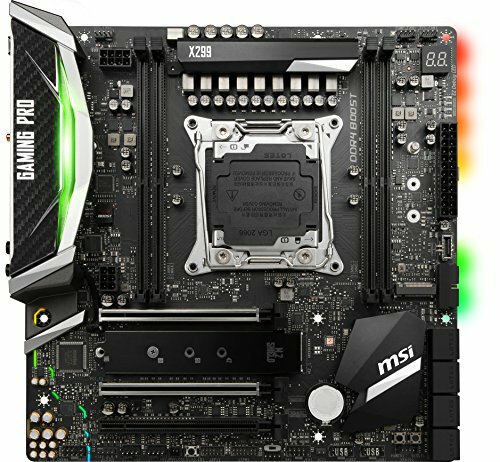 It’s dripping with features, costs less money than the majority of ATX X299 boards, it’s overclocking-friendly, and MSI’s EFI and software give you great tools to tweak and tune a powerful PC. If you want a small PC with decent performance and features, without the limits of a mini-ITX board, the X299M Gaming Pro Carbon AC delivers the goods for a reasonable price. 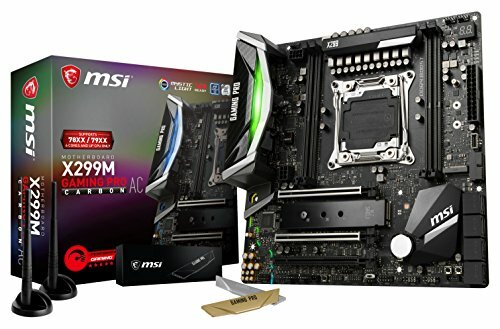 Most of the bang of high-end ATX X299 boards, but in a smaller, cheaper package.